A highly endangered, desert-adapted subspecies of the northern gray wolves, Mexican gray wolves once ranged from California to Texas and as far north as Nebraska. An extirpated native of Utah and Colorado, today Mexican gray wolves number just 114 in the wild in Arizona and New Mexico. Another 30 or so are in Mexico. Wolves have long been a focus of Western Wildlife Conservancy’s work. Director Kirk Robinson and board member Allison Jones served on the Utah Wolf Working Group in the early 2o00s. WWC is part of the Rocky Mountain Wolf Project and Lobos of the Southwest. 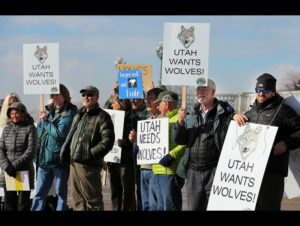 Western Wildlife Conservancy campaigned to get public comments, in favor of returning Mexican gray wolves to Utah, to the U.S. Fish and Wildlife Service during their comment period for the Mexican gray wolf recovery plan. Although clearly supported by the science, the final recovery plan released in November 2017 did not include Utah and Colorado in the recovery zone. 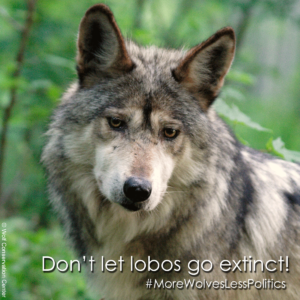 WWC also campaigned in Arizona and Nevada, generating phone calls in opposition to anti-wolf legislation to U.S. Senators in the spring of 2017. We continue to inform Utahns on the need to restore both northern gray wolves and Mexican gray wolves to our landscape through our tabling projects and social media work. We want to hear wolves howl in the Bear River Range, Uinta Mountains, Wasatch Plateau, Abajo Mountains, Dixie National Forest, Grand Canyon National Park, and the San Juan Mountains (among other places). Utah and Colorado need wolves. Wolves need Utah and Colorado. Would you like to hear wolves howl under the full moon as it rises over Tokewanna Peak in the Uintas or Tukuhnikivatz in the LaSals? Do you want to take part in making it happen? If so, you now have a great opportunity to help. The Rocky Mountain Wolf Project, which is working toward restoration of the gray wolf to western Colorado, needs to raise $100,000 for the next phase of its effort to educate Colorado citizens about the wolf and to promote the values of wolf restoration. And if wolves are restored to Colorado, there is no doubt that they will soon spread out as the population grows, so that many wildlands of eastern Utah will once again be home to their missing keystone predator: Canis lupus. There will be many ecological benefits to this rewilding, as well as an enhancement to the wilderness experience. Go to the website below and watch the 1 minute video to find out what it’s all about. Then make a contribution. Contributions add up. If 200 people each make a $10 donation, it equals $2000. If 200 people in each of the 50 states do this, the RMWP will have reached its fundraising goal for the next critical phase of rewilding the Heart of the West!